This page is a translated version of the page Onoto and the translation is 100% complete. De La Rue origin dates back to 1813, although the real start of fountain pen production dates back only at the beginning of last century. The company, however, was already operating in the 1800s in the field of writing instruments and it is the oldest British manufacturer of fountain pens. His fortune, however, stem from another activity, the production of playing cards, which led to even greater success when they entered, taking advantage of the technologies acquired for cards, in the production of paper money, in which the company is still operating. De La Rue entered the fountain pen history in 1905 for the creation of the first plunger filler model, introducing an automatic filling system that was functional and efficient even when all other brands, except Conklin, were substantially tied to the use of the eyedropper. Apart from the initial period, the company maintained a very conservative attitude, being a late follower for new stylistic tendencies. Fountain pen production was also a peripheral activity for the The De La Rue Company. Despite this, theirs pens were of the highest quality and are still highly sought and prized by collectors. After the advent of the ballpoint pen, production was discontinued in the late '50s, to be resumed, as for many other historic brands, in recent times. The De La Rue activities were started in 1813 by Thomas De la Rue in Guernsey in France, with the printing of the newspaper Le Miroir Politique. Three years later Thomas De la Rue moved to England and since 1821 began to operate as a printer in the manufacture of office equipment. The initial success of the company is however due to the creation of an efficient method for printing playing cards (up to then hand-painted) that constituted the early fortunes of the company, and its reputation as the creator of English playing card. But the real success came entering the market for the stamps and paper money production, which occurred with the experience gained in the production of playing cards. This made the company one of the most important British industries. Although commercial success has taken place much later, De La Rue presence in the writing objects market dates from the late '800, when, in 1881, they introduced the Anti-Stylograph pen , a first model of fountain pen, albeit primitive. Following other models were produced, as the Swift of 1884, distributed for more than 10 years, or the Pelican of 1895, another pen with a reservoir and eyedropper filled (but the american patent, nº US-466950, dates to 1891), and further models always having a tank valve, such as the Onostyle or the Umpire. 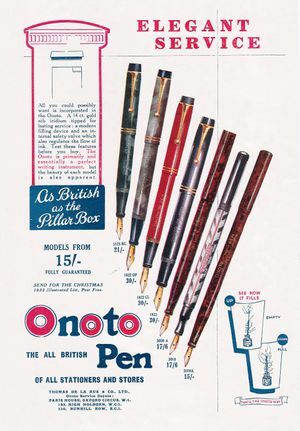 But the first modern fountain pen branded Onoto was born in 1905. At that time Evelyn Andros De La Rue, great-grandson of the founder, who had a passion for inventions, was striving to build a fountain pen that was actually functional, and had already filed several patents for a primitive plunger filler. But his pen was defective and required to be loaded a repeated pressure of the piston, whith a complex mechanism. During the same period George Sweetser made a pen based on the same principle but with an improved mechanism, substantially identical to the present one. George Sweetser showed his invention to Evelyn De La Rue who bought it immediately, and managed to convince his father Thomas Andros De La Rue, who was in the board of directors, about the validity of the investment, so that in 1905 was started a fountain pen production. The new pen was called simply Onoto. That name origin is uncertain and there are different theories. Some people date it back to Tokusaburo Ono, a Japanese watch manufacturer whose projects were used for the previous Onostyle pen, some others say it was chosen for its simplicity and because it is easy pronounced and with the same sound in many different languages. The financial strength of the company allowed a big launch of the new brand, and the new fountain pen was a huge success, so that in a short time was called: Onoto The Pen. 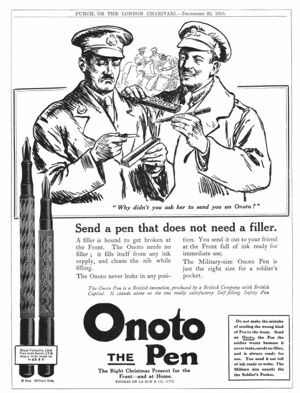 Earliest Onoto pen were made in black chased hard rubber, with overfeed nibs and produced in two sizes, the N and the O which later were called 3000 and 2000. The early models were produced in different colors and materials: to black chased hard rubber were added models in red/black marbled hard rubber, in red chased hard rubber, and also overlay models in silver or gold, decorated with filigree or guilloché; their prices ranged from half to 5 guineas. The N model remained in production for over 30 years until 1939, with little changes apart from the replacement of the original overfeed nib with an ordinary one. Given the pen success it was marketed also in France and in 1909 a branch was open in New York. But despite these fountain pen being much better from the technical point of view than the american competing models, the De La Rue did not make significant efforts to publicize its products in the high competitive U.S. market, not having a significant success. In the same year are cited some new models named Empire, Elfin and Express. In 1911 De La Rue lost the state contract for the production of stamps and underwent an internal restructuring to become a limited liability company owned by Thomas Andros and his sons, in 1915, Evelyn De La Rue resigned and the company remained in the hands of his brother Andros Stuart who did not have a significant interest in the production of fountain pens. The company suffered a drop in sales, which led in 1921 to restructure itself as a limited company, with the property that was essentially sold to a consortium of three other major companies. In those years however production continued without significant changes, the company had in fact a functional and efficient fountain pen, and saw no reason to make changes. However marbled hard rubber was introduced (1913?). In a 1913 catalog are cited the Hermit (a safety) and Pentago models, where the Valvless model is in 1915. The overfeed nib was replaced by an ordinary nib in 1921, when it was also introduced the Ink Pencil, a plunger filler stylographic model. In the '20s there were several innovations, hounded by competition Onoto began to produce lever filler models, the 7000 and 8000. The introduction date of these models is uncertain and various sources report either the 1922, 1923 or 1924. In 1924 was also produced the Mammoth 1800 model, a pen with a large number 8 nib, and the following year the Princess Mary a model made in blue colored hard rubber. It was also started a production of pens simply called De La Rue, from which is known the Swift model. The company continued to resist the trends and innovations, as well as the introduction of celluloid is quite late; even in this case are given different dates, the 1926 or 1928. In 1927 production was moved to Strathendry, Scotland, in the Leslie village in Fifeshire, Lambrou cites the move as a counter to the claims brought forward by the unions at the site of Burnhill Row in London. The move included the dismissal of all those who not wanted to transfer, but not proved very effective because of the presence of a dismissed at the shareholders meeting, which brought in around a month all transferred employees to apply for membership to trade unions. On the company website you will find a different story, in which thirty of the most capable workers agreed to move from London, with the company that took charge of finding them a home. In the '30s the company continued doing its production from Strathendry, which began in 1928 with the De La Rue Pen model, a celluloid pen, made in different colors like black, blue marbled, green and red. There were also produced lower price pens as the Swift and Everybody's Pen. In 1935, following the trend introduced by Vacumatic for transparent pens that lets you view the ink level, Onoto the introduced Visible-ink model. 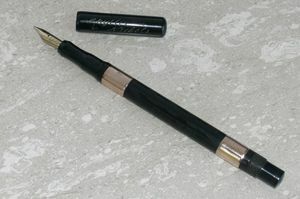 But the company most significant model was introduced in 1937, when Onoto launched the Magna, a large pen like the previous Mammoth, with a two-color nib, the three rings ont the cap, produced in a new translucent celluloid created with a very complex process, in the black chiseled, green/brown and silver/gold colors. These pens were joined by other smaller models called Minor and Dainty. WWII however weighed negatively on the diffusion of the new pen, with the production that was soon converted to armaments to support the war effort. After the war production resumed at full speed only since 1947 with the reintroduction of a new Magna series, some of which were lever filler. 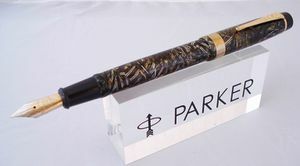 In the same period were also introduced a new set of pearly marbled pens. But at that rime the company had lost all its innovation capacity, and continued to produce economic lever filler pens substantially following market trends with the Onoto Penmaster an hooded nib pen with metal cap. They also went in the ballpen market. Like happened with other big producers, competition from disposable ballpoint dealt a mortal blow to the company, the latest significant product was the Onoto K of 1955, a piston filler pen with hooded nib, visible tank and friction cap, produced in different versions. In 1958 pens production by the De La Rue finally ceased with the closing of the Strathendry factory occurred February 27, 1958. The production however continued for some years, until 1963, in Australia, where the Backer Norman and the Longhurst Pty Ltd. who managed Onoto distribution for 32 years, took over the brand. Like many other historic brands also Onoto was brought back to light in recent times for the production of modern fountain pens. ↑ like the nº GB-190502671. ↑ George Sweetser registered patents nº GB-190513768 and nº GB-190704787. ↑ respectively here, here and here; Andreas Lambrou speaks of a 1924 patent. ↑ respectively this gives the 1926 and this, this and Andreas Lambrou the 1928. This page was last edited on 2 February 2019, at 02:46.